For any pork or grill lover, ribs are a succulent treat. The delicious fall-off-the-bone meat slathered in a sweet, sticky sauce can make any mouth salivate for a taste. It's a must-have for your next BBQ party. There are many methods for cooking ribs, and it can become overwhelming. A quick search will bring up recommendations to boil, braise, bake or steam them. But because I'm a grill enthusiast; I'm bringing ribs to the great outdoors of your backyard BBQ. So here you have the best, easiest way of preparing and grilling a tasty batch of ribs. If you have any experience grilling or cooking with meat, you know the cut matters. For ribs, there are generally two main cuts of meat to choose from. These are known as spare ribs or baby back ribs. 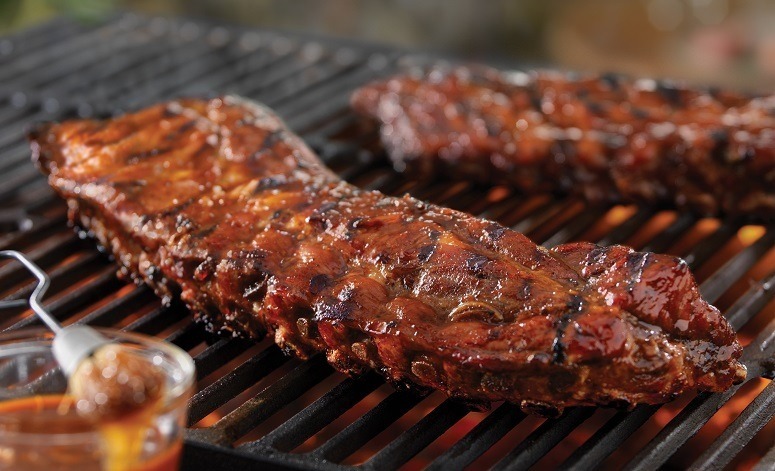 Baby backs are typically a bit more expensive than spare ribs, as they generally have more meat. But with either cut, you can get a great tasting dish. Baby back ribs are many people’s preferred choice. They're cut from the top of the rib cage, just beneath the tenderloin. The bones are usually shorter and curved but have more meat, both on top and in between. While these are usually more expensive, they require less cooking time. When you're looking to buy a rack of baby back ribs, make sure to look for one which has the most meat. Ideally, there should be loads of fat streaks (white lines). If you see white dots, it means the cut was too close to the bone; steer away from those. Don't buy a rack which has been pre-marinated. These are usually slathered in salt or brine which can interfere with your spice rub. So again, avoid those. Head to the butcher and ask for the meatiest ribs he has. Spare ribs originate from the interior part of the rib cage and they're generally flat and straight as opposed to the baby back. On these cuts, you'll typically see more bone than meat. However, depending on the pig, there could be more fat which helps tenderize the meat and make it melt-in-the-mouth soft. Now that you've chosen your meat, it's time to prepare it. First of all, if the butcher hasn’t done it, you'll have to trim the meat. Make sure you have enough space on your countertop to place and work with your meat. Have a sharp knife on hand, as well as a spoon or a butter knife. his piece you can cut off and use another time. Then you'll need to trim off any excess lumps of fat as well as any silver skin on the meaty side. Now turn over the ribs, so the bones are visible. If you look at the bone, you can see a thin layer of skin, or membrane. You can leave this on if you like. However, when grilling, most people find that it's better to trim that off as well. Trimming the membrane helps the flavor from the spice rub and sauce to infuse the meat. Take a spoon or blunt knife and try to lift a small flap off the bone. Once you've got that, pull it gently but firmly across the rib cage to get it all off in one piece. Now it’s ready for some character. To give your ribs that delicious taste, you’ll need to summon all the spices from your cabinet. Without those, I guarantee they won’t be nearly as tasty or impressive to your guests. A spice rub can be anything you prefer, dry or wet. Although, for grilling, many opt for the dry rub to avoid a burnt taste. If you're feeling confident in your grilling skills, you can even try your hands at a mix containing sugar. Adding sugar is bound to create a more profound or “colorful” flavor. Plus, sugar has an astonishing ability to caramelize the meat when heated and melted. On the downside, if you're not good at regulating the temperature, sugar can burn and give the meat an unpleasant, bitter taste. A simple spice rub won’t detract from any of the natural pork flavors. Here's a basic five-ingredient mix for you to try. Take a piece of paper towel and pat the meat dry before sprinkling on a generous amount of the mixture. 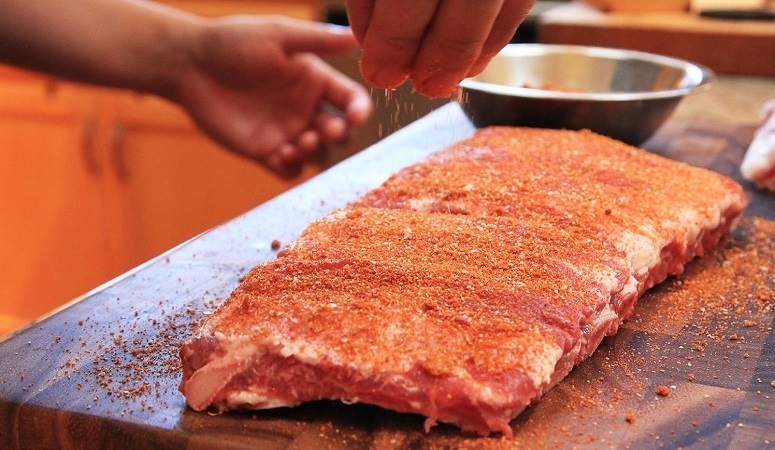 Give your ribs a good spice massage on each side and make sure it covers the surface. If you were to grill it right away, the flavors from the spices wouldn't have had a chance to saturate the meat. This is why it’s essential to rest the ribs before grilling them. 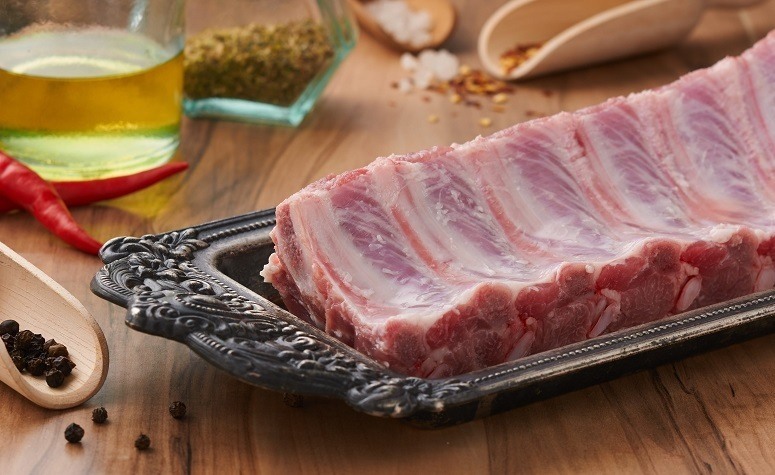 Place the ribs in a container or tray, cover with plastic wrap and leave them in the fridge. They should rest for at least 30 minutes. You can also make them in advance and leave the ribs to marinate in the rub overnight. Now that the meat is flavored and resting in the fridge, you can get started on the grill. If you have a gas grill, set it on high heat and close the lid. For a charcoal grill, light the coals and heat them until you see a generous coat of ash. Once it's ready, clean the grates using a firm bristle brush. Make sure you coat the grill grates with some oil so that the meat won't cling. Use a pair of tongs and dip either a piece of paper towel or foil in some oil and brush it on. You don't need a lot, just enough so that it looks greased. We all love that juicy tender rib which melts in your mouth. But ribs are mostly bones, which means they're best when slow cooked. On your gas grill, turn off the center flames and leave the sides on medium to low heat. This will allow for a more gradual cooking process. If you're using charcoal, move the coals to one side to avoid direct heat. A little tip is to place an aluminum pan underneath the grate. This will prevent any juices or oil from spilling onto the fire which may cause a flare-up. For a charcoal grill, it's a good idea use two disposable trays during the cooking. As mentioned, set one under the grate to prevent flare-ups, and the other is placed beside the meat. This second tray should be filled with water so moisture can build up inside your grill, allowing the meat to stay juicy. You can also add different types of wood or coals to your charcoal grill, to give the meat a distinct smoky flavor. For a gas grill, it can be more of a challenge to get that unique smoky flavor. But it's not impossible. With a few damp wood chips wrapped in a piece of tin foil, you can make yourself a sweet little "smoke bomb." Poke some holes here and there, and place it underneath the grate. As the heat comes through, smoke will arise and infuse your ribs. Just make sure your grill is hot enough to get that combustion going. Once the smoke appears, you can adjust the temperature. Take your ribs out of the fridge and place them onto the grate. Let them simmer on each side for a while to get that golden brown color. Once the meat has reached a beautiful shade, take it off the grill. Wrap the ribs tightly in foil and set them back on the grill to cook away. Try to avoid lifting the lid too often because everytime you open, cold air seeps in and heat comes out. You can also cook them without the wrap. However, the cooking process takes a long time, which means they might get dry. When you cover the meat, it enables the ribs to soak in their juices, keeping them moist and flavorful. Wait an hour, then come back and wrap an additional layer of foil around your ribs. Check if your charcoal grill needs more wood. You can add more just for flavor. After about another hour, check for readiness. If they feel soft and ready to come off, take them out and unwrap them. Place one side back onto the grill to add some texture before saucing it up. Take your favorite BBQ sauce and with a brush, gently cover one side of the ribs with a thin layer. Flip them over and repeat. Close the lid and leave for five minutes. 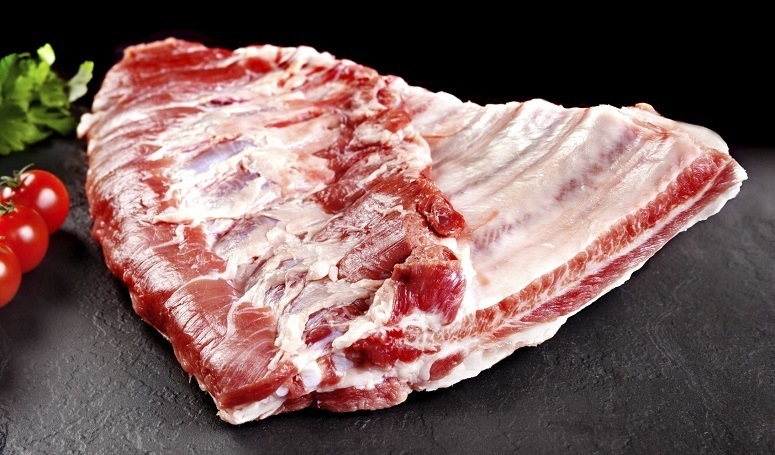 When your ribs are ready to come off, wrap them lightly and let them rest for a few minutes on the table. This will ensure the moisture and juices stay inside the meat. After about five minutes they should be ready to serve and enjoy. Here you have your guide on making the best ribs on a BBQ. Cooking ribs on a grill is simple once you've mastered the basics. Just make sure you have a good piece of meat, the right spices and a heated grill. Get your favorite BBQ sauce ready and cook up some sticky, juicy ribs.